Somalia was created on 01 July 1960 following the independence of Italian Somaliland from Italy, which then immediately united with British Somaliland to form the Somali Republic. British Somaliland had gained its independence just five days earlier on 26 June 1960. Although Somalia is currently regarded as a "failed state" with a weak, but recognised central government authority, the new Federal Government of Somalia established in August 2012 is the first permanent central government in the country since the start of the civil war. De facto control of the north of the country resides in local authorities, of which Puntland, Maakhir and Galmudug acknowledge the authority of the federal government, and maintain their declaration of autonomy within a federated Somalia. Southwestern Somalia and Jubaland, in the south, have largely abandoned the idea of autonomy. Somaliland in the north has declared itself independent from Somalia and does not recognise the authority of the federal government. Somaliland's self-declared independence is not recognised. The British established a protectorate in 1886 over what became known as British Somaliland and the Italians colonised the south in 1889, which became known as Italian Somaliland. Italy, under Mussolini, invaded Abyssinia (now Ethiopia) in 1935, in an attempt to colonise it. This action was condemned by the League of Nations, but little was done to prevent it or to liberate Italian occupied Ethiopia. On 03 August 1940 Italian troops invaded British Somaliland from Ethiopia and succeeded in occupying the territory until January 1942 when Britain launched a campaign from Kenya with the objectives to liberate British Somaliland, Italian-occupied Ethiopia and conquer Italian Somaliland. By February 1942, most of Italian Somaliland had been captured by the British and in March, British Somaliland was retaken liberated from the coast with the help of Somali patriotic forces and placed under British military administration. Northern Somalia would remain a protectorate, while southern Somalia by agreement became a United Nations Trusteeship in 1949. In 1960, the two regions united as planned to form the independent Somali Republic under a civilian government. Mohamed Siad Barre seized power in 1969 and established the Somali Democratic Republic. In 1991, Barre's government collapsed as the Somali civil war broke out. Neighbouring Djibouti was maintained as a French colony until it obtained independence in 1977. In the absence of a functioning central government, various autonomous and semi-autonomous regions (such as Somaliland, Puntland and Galmudug etc ) have emerged and in the early 2000s, several fledgling interim federal administrations were created. The Transitional National Government (TNG) was established in 2000 and this was followed by the formation of the Transitional Federal Government (TFG) in 2004, which reestablished national institutions such as the military. In 2006 the TFG, assisted by Ethiopian troops, assumed control of most of the nation's southern conflict zones from the newly formed Islamic Courts Union (ICU). The ICU subsequently splintered into more radical groups such as Al-Shabaab, which battled the TFG and its allies for control of the region, with the insurgents losing most of the territory that they had seized by mid-2012. During 2011 and 2012, a Roadmap political process providing clear benchmarks leading toward the establishment of permanent democratic institutions was launched and it is within this administrative framework that a new Provisional Constitution was passed in August 2012, which formally designates Somalia as a federation. Following the end of the TFG's interim mandate the same month, the Federal Government of Somalia, the first permanent central government in the country since the start of the civil war, was also formed. The following list is intended to provide an overview of many of the mini-states located throughout Somalia. [For an more up to date list go to this page - Ed]. Galmudug, which claims to run a combination of the Mudug and Galgadud regions, was first to test this theory of mini-state in 2006. Since that time, it has become a kind of role model for many mini-states claiming to govern areas over which they actually have they have little or no control. Himan and Heeb was established in 2008 and mainly covers parts of the Galgudud regions. One of the oldest of the regional states proclaimed in Somalia, it is dominated by the Saleeban sub clan of Habar Gidir. Himan and Heeb was presumably a direct answer to the Sa�ad dominated Galmdug administration. The two homogenous clans of Galmudug and Himan and Heeb are the most influential and had some permanent presence in Galkacyo and Addado, and a technical presence beyond these two towns. Officials from both Galmudug and Himan and Heeb made efforts to unite the two administrations but failed as neither leader wanted to lose his government position. Mohamed Abdulahi Ticey serves as president. Gal-Hiran and Haradhere wants control of Galgudud region and parts of Hiran. Its supporters are mainly part of the Ahlu Sunnah Wal Jaama (ASWJ) and the main cities in this state include Dhusamareeb, Guri-cel, Marer Gur and Haradhere town which are considered to important pirate strongholds. Abdilqadid Mohamed Bahdoon is the president of the state, which is dominated by Ayr, a sub clan of Habargidir. The state was founded on 23 September 2010 and has relations with the TFG. El-Bur State was created in London on 05 June 2011 to run the El-Bur district in the Galgagud region of Somalia. El-Bur was formerly the capital of the Galgaduud region and once served as a local commercial hub. Abdillahi Malim Asparo is the president of El-Bur state, though al-Shababa and Ahlu Sunna are currently fighting over El-Bur. It is located approximately 375 km north of Mogadishu. Mareeg is a region in Galgadud based on the Ajuuran sultanate in the Middle Ages. It was established in April 2011 and exists in the Galgudud and Mudug regions. Its main administrative area is between Haradhere and Budbud towns and includes approximately 250 km of seashore. Dayib Mohamed Sheikh serves as president of Mareeg. Its leaders have called on Somali businessmen to build a new port and roads linking the state with the other parts of Somalia, with the purpose of encouraging regional development. Somali Central State was established in 2011 and claims control over parts of Galgudud and Mudug regions and has links with Himan and Heeb. The center of the regional state is Abudwak and is dominated by the Mareehan clan. It does not yield much political power and has been overshadowed by disagreements with ASWJ, which is currently the most powerful force in Abdudwak. Mohamed Hashi Abdi is the president. He was arrested in Abdudwaq by ASWJ militia forces. Galgaduud state was formed in Dubai in April 2011. Its goal is to run the entire Galgadud region, despite the fact that the states of Galmudug, Himan and Heeb, Mareeg, El-Bur, Gal-Hiiran and Somali Central state all intend to run their own regions. Abdirashid Mohamed Dirir is the president of Galgaduud state. Dubad is the president of this administration. Dooxo state was reportedly established in 2011. Its goal is to govern parts of Galgadud and possibly the Mudug regions. Bashir Abdulahi Abshir is the president of Dooxo. Little is known about this state. Bila Quban state was created in April 2011. It wants to govern the area from Fah, located 30km from Haradhere district, north to the Hurow, which is located 1km from the Hilawe Gab village in southern Somalia. Azania was established on 20 March 2011 in Kenya and is supported by Kenya, which is interested helping develop a regional administration and establish a buffer zone against threats from al-Shabaab. Azania state is led by Mohamed Abdi Gandhi, a former Somalia defence minister. He is an educated man who has personal contacts with the governments of both Ethiopia and Kenya. The regional state works in Gedo and Lower Jubba regions, and its capital is Bu'aale town. Jubbaland (2) (Jubaland) was established in January 2012 is considered a rival regional to the state of Azania. Jubbaland desires to rule Lower Jubba, Gedo and Middle Jubba. Mohamed Farah Du'aaleh is the president, but is not as well known as Mohamed Abdi Gandhi, the leader of Azania, who has links with Ethiopia and Kenya. Jubbaland has no direct contact with these countries who support pro-government militias including the ASWJ and Ras Kamboni fighting against al-Shabaab in lower Jubba and Middle Jubba. Unlike Azania, Jubbaland has the support of the local people in the regions who are reportedly suspicious of Azania's links with Kenya. Jubba and Shabelle was founded on 05 July 2011. It wants control of the Jubba regions in the south and parts of the Bay region. The supporters of this regional state are the Somali Bantu or Jareerweyne community and those of Digil and Mirifle. Abdi Osman Omar is the president of this regional state. Jubba-Ras was created 08 January 2011 in Scandinavia. It claims to have a legitimate right to govern the Lower and Middle Jubba regions of Somalia. The supporters of this administration are the Biyo-maal community. Abdi Qadir Mohamud Yusuf is the president of Jubba-Ras state of Somalia. Little is known of Mr. Yusuf other than he is young and calls himself "Engineer" (though it is not known if he has earned this nickname through legitimate academic studies, or if he simply prefers the name). Jubba-Jasiira's formal founding date is unknown; however, the Nairobi-based community from Shiiqaal held a welcoming party for Jubba-Jasiira's president Abdi Ahmed Osman on 03 January 2011. It wants to administer the Jubba regions in south Somalia. Greenland state was founded in Kenya�s little Mogadishu district of Eastliegh in Nairobi in 21 November 2010. Like Jubba-Jasiira, Greenland state wants to rule in Jubba regions of Somalia. Dr. Mohamed Ibrahim Afkule is the president of this administration. Dooxada Cagaaran state was created in Mogadishu in 08 May 2011. Ali Mohamed Ibrahim is the president of this administration, which, like the two states described above, also wants to control Jubba regions of Somalia. Udubland state was established on 17 February 2011 by President Ibrahim Abdullahi Addo. It claims to represent the communities of Lower Shabelle and the two Jubba regions and wants to govern these three combined regions. Bay and Bakool) though each of these already has its own mini-state. South West state was initially formed in November 2002 in Baidoa (capital of the South West state) to govern Bay and Bakool regions but it is renewed in April 2011. It currently wants to control the Gedo, Bay, Bakool, Middle Juba, Lower Juba and lower Shabelle regions in southwest Somalia. Sayid Ali Sheikh Mohamed is the president of this administration. Koofur-Galbeed - During the course of this research, Somalia Report discovered another South West state, called Koofur-Galbeed also claiming to administer the same area of Sheikh Mohamed�s South West state. The president of this administration is Dr. Ali Abdi Baab. It is unclear whether one replaced the other but it is possible they are independent. Hiran (also Hiiraan) state was established on 10 August 2010 and seeks to rule the entire Hiran region. This region has a strategic significance as it links southern regions to central Somalia. It is also of strategic importance to Ethiopia, which wants to use the region as a buffer zone to control the movements of the radical Islamists of al-Shabaab and ONLF. Hiran state is led by Mohamed Abdi Gab and is set against Gal-Hiran state and Shabelle Valley Administration (SVA) which also claim to be the legitimate states in the region. Dooxada Shabelle or Shabelle Valley Administration (SVA) wants control of the central regions and Hiran and maintains an unspecified number of armed militia. It was founded on 13 April 2011, apparently in reaction to the establishment of Hiran state in September 2010, which is dominated by the Hawadle and Jijeele clans, including Gaal Jecel, while some of Gaal Jecel are opposed to this new state. Abdifitah Hassan Afhrah is the president of SVA and recently rejected the TFG�s plans for creating an administration in Beledweyne after a bitter disagreement between ASWJ and SVA over the control of Hiran region. This comes after Ethiopian troops backed by SVA forces and ASWJ seized Beledweyne from al-Shabaab forces in December 2011. It should be noted that the Somali government nominated Abdifatah Hassan Afrah to be governor of Hiiran region. diaspora including its president Mukhtar Sheikh Abdirisak. Hiiraan and Midland state was established June 2010 in London. Abdiqadir Adan Abdi is the founder and the president of this administration. Shabeelaha Dhexe state or Middle Shabelle state was formed in January 2009. It wants to manage the Middle Shabelle region in Somalia. Ali Madahey Jawle is the president of this mini-state. are considered to the "others" group who receive half due the power sharing formula of 4.5. Banadir state could have influence on supporters living mainly in the districts of Hammerwein, Shingani districts of Mogadishu and in Marka and Brava in Lower Shabelle region. Abba Awow Haji is the president of Banadir. of this administration but its president Mohamed Abdirahman Ali claims a legal right to manage the three regions of Somalia. The Banadir region �Mogadishu� has already has a TFG-formed administration. Mogadishu will be the headquarters for the administration. Jiin-webi was founded on 01 October 2011 and is supported by the Somali Bantu or Jareerweyne communities, a minority group that descended from tribes in East and central Africa. These communities include the Wagosha communities and are discriminated against by tother Somali clans. This group is mainly made up of peasants living Lower Shabelle, Middle Shabelle, Lower Jubba, Middle Jubba and Hiran. They joined with the .5 of the 4.5 clan sharing formula in parliament; therefore, they are not well represented. Mohamed Ahmed Hussein is its president. 2011. Jibril Haji Mohamud is the president of this administration. Wargaadhi State was formed May 2011 in Nairobi. It seeks to run the Middle Shabelle region. Yusuf Hundubay is the president of Wargaadhi State of Somalia. Hir iyo Maanyo was established in 2011. It wants to administrate the Lower and Middle Shabelle regions of Somalia. Engineer Ahmed Bajuu is the president of this administration. Abweyn State was formed in September 2011. Its goal is to rule the Banadir, Lower and Middle Shabelle regions of Somalia. Abdullahi Abdi Mohamed is the president of this administration. Doxa-joog. This regional state has contacts with Maakhir, Mareeg, ASWJ, the TFG, and Khatumo, but almost has no contact with Puntland authorities. Ras-Aseyr claims they were forced to declare their own state, which lies within Puntland borders, after Puntland failed to develop their area and even neglected the needs of its people. Puntland, furious over its formation, has battled with the group for control of Bargaal, an eastern coastal area of Puntland driven by the Siwaqroon sub clan of the Majerteen. Karkaar state shares its name with the mountain rage which runs through it and is mainly the southern area of Bari region of Puntland. Maakhir was established in June 2007 after a dispute with Puntland authorities over a range of issues, including mining and oil resources. The biggest cities in the Maakhir state are Las Qoray, Badhan, Hadaaftimo Hingalol and Erigavo. Maakhir state was established by the Warsengeli sub clan of Darood and is not recognized by the government of Puntland. Jibril Ali Salad is the president of Maakhir state and maintains a parliament and a cabinet of ministers. The Federal Republic of Somalia was established on August 20, 2012. The flag of the Federal Republic of Somalia, as shown in section A of Schedule One, is a light blue rectangle in the centre of which is a white star with five equal points. The emblem of the Federal Republic of Somalia, as shown in section B of Schedule One, is a blue shield with a gold frame, in the centre of which is a silver-coated, five-pointed star. The shield is surmounted by a decorated emblem with five golden heads, with two lateral ones halved. The shield is borne from the sides by two leopards facing each other under the lower point of the shield, along with two palm leaves, which are interlaced with a white ribbon. Somalia has a national anthem which is �Qolobaa Calankeed�. The Federal Member States of the Federal Republic of Somalia shall have their own flags and national symbols in accordance with the federal system. The flag, as illustrated in the Constitution, bears a star considerably smaller than that used previously. However, no official specifications as to the size of the star are provided. For Somalia : PMS 277 blue. The vertical flag is simply the horizontal version turned 90 degrees clockwise. The Transitional Federal Government of the Somali Republic adopted the flag for all of Somalia which is exactly the same as the original Somali flag. 1. The National flag for the Transitional Federal Government shall be of rectangular shape, azure in colour with a white star and five equal points emblazoned in the centre. 2. The emblem of Transitional Federal Government shall be composed of an azure escutcheon with a gold border, which shall bear a Silver five-pointed star. 3. The escutcheon shall be surmounted by embattlement with five equal points in Moorish style, two lateral points halved, borne by two leopards rampant in natural form facing each other, resting on two lances crossing under the point of the escutcheon with two palm leaves in natural form interlaced with a white ribbon." 1. The Transitional Federal Government of the Somali Republic shall have a decentralised system of administration based on federalism. a) The Transitional Federal Government. Somalia adopted a light blue flag in honour of the United Nations Organisation that had controlled the country until the independence. The star has 5 points - one for each branch of the Somalis: Issas of Djibouti, Somalis of Ethiopia, Issaks of Somaliland, Somalis of old Italian Somalia and the Somalis of North Kenya . The five points of the star on the Somali flag simply represents the previous colonial area where the mostly Somali speaking people live and lived. Light blue flag with white five-pointed star. I tried to find out whether there is some legal background of this flag available on the internet, but without success. It seems that a draft new constitution has been tabled but I was unable to locate the text on-line. I also tried to locate previous legislation relating to the flag, but once again in vain. The previous 1979 constitution is de facto not valid, and apparently no-one quotes it on the internet. The flag is older this as it dates from 1954. I was hoping to find at least a hint on how big the star should be "de jure". Looking the Somalian government site, it seems they use the same Coat of Arms, without any changes as shown in Smith [smi82], which is the original 1956 design. The site also shows the white-star-in-blue flag nicely. 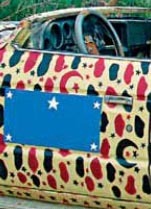 The front page of the Portuguese newspaper P�blico today shows a photo by Ali Musa Abdi (of Agence France Presse) showing what seems to be a home-made light assault vehicle covered in an interesting camouflage pattern and with what seems to be a flag painted or pasted on the driver's door as shown below from http://jornal.publico.clix.pt/Default.asp?. This is a medium or light blue ~1:2 rectangular panel with four small white five-pointed regular stars pointing up at each corner and a larger one at top center. This design attached. Željko Heimer complains that he has not found any legal text on the flag of Somalia. He refers to the invalid 1979 Constitution, whose relevant articles are quoted by Pascal Vagnat & Jos Poels in their book "Constitutions - What they tell us about national flags and coats of arms" (SAVA, Dec 2004). The Constitution was adopted on 25 August 1979 and came into force in 1984. 1. The national flag shall be azure in colour, rectangular, and shall have a white star with five equal points emblazoned in its centre. 2. 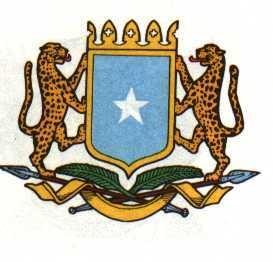 The emblem of the Somali Democratic Republic shall be composed of an azure escutcheon with a gold border and shall bear a silver five-pointed star. The escutcheon surmounted by an embattlement with five points in Moorish style, the two lateral points halved, shall be borne by two leopards rampant in natural form facing each other, resting on two lances crossing under the point of the escutcheon, with two palm-leaves in natural form interlaced with a white ribbon. Therefore, the scan of the coat of arms we show below is wrong and Smith is right: the ribbon should be white and not yellow. In 1949 the General Assembly of the United Nations (UN) decided that Somalia would be under the former colonial power (Italy) as a trusteeship territory for ten years. There were three other governments who were members of the UN Commission that were sent to Somalia as an advisory council of the trusteeship administration of Somalia. They were Egypt, the Philippines and Columbia. In April, 1950 the Italian trusteeship administration took control of Somalia and the British military administration withdrew. During the early months of 1954, a legislative council had been formed by the Italian trusteeship administration and the advisory council of the UN. The members of the legislative council were composed Somalis, Italians, Arabs and Indians. They had to prepare all laws and legislation concerning the country for the ten years of trusteeship under the United Nations. The members were not elected, but each political party, foreign community or any other recognized organizations were asked to select members. Mr. Mohammed Awale Liban had been selected by the Somali labour trade union. Then members suggested the the Somalia national flag must be adopted by the legislative council in order that the Somali people could get to know their National Flag before independence. When the legislative council agenda reached the discussion on the Somali National Flag, Mr. Liban proposed that only the Somali members should discuss the issue. According to the legislative council's constitution each new proposal had to be voted on by all the council members. Mr Liban proposal was adopted and the Somali members of the council chose Mr. Sheik Omar to be Chairman. The temporary new chairman said that the issue of the national flag would be debated the next day, following which Mr. Liban went home and started to design the Flag. He chose the blue colour to represent peace and the UN and placed a white 5-pointed star in the centre. Each point of the white star was to represent the five Somali regions which had been divided by the colonial powers. The next morning the council session started around 10:30. However, once the chairman had opened the session Mr. Liban requested a chance to speak, which was granted by the chairman. He stood up in front of legislative council members and stretched out on his chest the blue flag with a white star in the centre. As he kept on stretching the flag across his chest, the Somali members applauded and cheered while clapping for five minutes. The temporary chairman made a short speech in which he acknowledged the ability of Mr. Liban whose talent had produced such a beautiful flag less then 24 hours. Mr. Mohammed Awale Liban said the blue color stands the United Nations who help us to reach our dream of independence; white means peace and prosperity; and the star is the five regions of the Somali people. Garowe Online News, 25 June 2006 reports that "Preparations for the celebration of the first day the national flag rose on Somali soil are currently underway in Baidoa, the temporary hub of Somalia's interim government. Tomorrow, Monday, June 26, 2006, marks the 46th anniversary since the first Somali flag was raised in the city of Hargeisa, after the ex-British Protectorate of Somaliland gained independence from European colonialism. Interim Somali President Abdullahi Yusuf is scheduled to give the keynote address in Baidoa to mark the anniversary of Somalia's Flag Day, which will attract thousands of people and government personnel. A similar celebration is also being prepared in Mogadishu, Somalia's national Capital. This anniversary is special because the notorious warlords have been expelled [from] Mogadishu and a semblance of law and order has returned." The Flag Day in Somalia is therefore 26 June, celebrating the first hoisting of the flag of the independent Republic of Somalia on 26 June 1960. As it was the case in other African countries, the flag was adopted before the independence, during the Italian trusteeship (1950-1960). The coat of arms was adopted in 1956. The leopards which support the shield and the white star were also found on the arms used during the Italian administration. The arms of Somalia of 8 June 1919 featured a shield divided horizontally by a wavy white line. The top half of the shield was blue with a leopard in natural colour surmounted by a white five-pointed star. The present arms were adopted on 10 October 1956. Therefore, the scan of the coat of arms above is wrong and Smith is right: the ribbon should be white and not yellow. Album des Pavillon [pas94] shows the Somali roundel as a blue disc with a white five-pointed star, the points of the star nearly touching the border of the disc. This of course does not prove that there are still aircraft showing this roundel. Encyclopaedia Universalis Yearbook says: "Armed forces: Tribal war since 1991." Ivan Sache, 01 Feb 2002. Roundel based on the flag - blue with white star. Dayuuradaha Xoogga Dalka Somaliyeed was formed in 1961 but is is not active since 1991. [cos98] and [whe86] report the roundel as appears above. [cos98] also reports a fin flash used by some of the planes as light blue vertical oriented rectangle charged with a star at the upper left corner and wavy dark blue bar connecting the right top corner with the lower left. Some photos show the roundel also as fin flash though. Did the flag of Somalia undergo a flag change? I received 3 of these VEX IV flag cards, and on one of these cards, it shows a flag of Somalia which features the star in a triangle, set against a light blue background; in addition, there are also 3 stripes consisting of green-white-orange. Does this flag sound familiar, or is this is an older flag? I cannot identify the "star set in a triangle", but the green-white-orange sounds very like the 1996 flag of the Somaliland Republic (formerly British Somaliland and de facto independent)? This is a vertical tricolour of green-white-red with a black star in the centre and the Islamic statement of faith in white on the green stripe. The flag you describe sounds like that of the Somali National Regional state flag, which is part of Ethiopia, and not to be confused with Somalia. "1. Xaaji thanks the lord for the reality of a Somali flag being hoisted for the first time in his life. 2. He compares the flag to the full moon which covers the world with its light. 3. He compares it to a Quranic verse or Sign revealed by the Lord. 4. He regards the flag as a sweet smelling breeze sent by the Lord from heaven. 5. He humbly acknowledges that he cannot praise the flag enough with his tongue. 6. He compares the flag to the sky on a cloudless day. 7. He describes the flag as being adorned with a flaming star that shines brightly. 8. He describes the color of the flag as being blue. (He uses the Arabic word Asraq instead of using the word Bluug that most Somalis use for the blue colour). Kenya, Uganda and Tanzania and thus influencing these countries to also seek independence). 10. He mentions that the flag will unite the Somalis divided by the colonialists into one country (The dream of many Somalis even in these dark times). 11. He finally thanks the Lord for Somalia being finally recognized by the world."